Lobsang Gendun, a monk from Drongsar monastery, was sentenced to 10 years' imprisonment after calling for the Dalai Lama's long life and Tibet's independence during official celebrations marking the 92nd anniversary of the Communist Party of China. He is being held incommunicado and is reported to have been tortured in detention, leaving him unable to walk. Neither his charges nor his location have been confirmed by the authorities. Lobsang Gendun is part of Free Tibet's In The Dark campaign, which aims to find disappeared Tibetans and work for their release. We are working on the cases of eight political prisoners held by the Chinese authorities, all of whom remain cut off from the world with little or no information about their location or current condition. Urge China to release them and respect human rights! 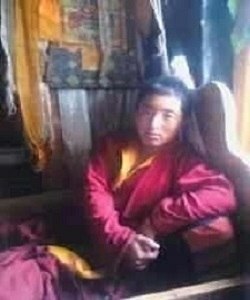 We are writing to you to request the immediate and unconditional release from prison of Lobsang Gendun (洛桑根敦, Luosang Gendun), a monk from Drongsar monastery in Pashoe County in the Tibetan Autonomous Region. Lobsang Gendun is currently serving a 10-year prison sentence following a protest he carried out on 1 July 2013 in Chamdo (Changdu). During the protest he allegedly called for the Dalai Lama’s long life and Tibet’s independence. According to our information, Lobsang Gendun was tortured in detention, leaving him unable to walk. A trial appears to have taken place in secret in September 2014 but since then there has been little information about Lobsang Gendun’s whereabouts or condition. We are gravely concerned that Lobsang Gendun appears to have been arrested solely for peacefully exercising his right to freedom of expression and tortured, both violations of China’s obligations under international law as well as its own Constitution and its Human Rights Action Plan. Lobsang Gendun also appears to have been denied a fair trial including access to legal advice, a violation of international standards on fair trials. Lobsang Gendun‘s location has not been confirmed, nor has his current condition in prison. This raises concerns that he is at risk of further torture or other forms of ill-treatment, and could also be being denied access to necessary medical treatment. We are looking forward to your immediate response.